They had toiled all night with nothing to show for their labor. The morning found them ashore washing their nets. Then Jesus entered Simon’s boat. At His request, Simon took the boat out from the shore. After he taught the people, the Lord commanded Simon Peter to launch out into the deep and let down the net for a catch. 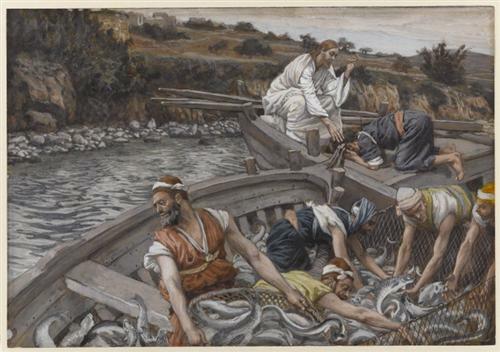 Luke 5: 6-7 says the multitude of fish was so great they needed help to gather them to shore. When reading this story many questions come to mind. What if Peter had not been willing to stop what he was doing and obey? What if he had continued with the task at hand—washing his net? What if he had refused to soil the net again? What if he had ignored his visitor? As with every story, there is a lesson. When Jesus approached Peter, he first requested an action and then waited for Peter to respond. Today, He waits for my response. Next, the Lord gave a command and waited. Today, He commands me through His word. It is my choice to obey. For his obedience, Peter redeemed his losses from the night before. Today, I will be blessed for my obedience. Be sensitive to His presence. Mornings follow even the darkest nights. Learn to recognize the voice of the Master. At Your word, I will reap the harvest You have planned for me!